If you are looking for a better strategy to handle your email, try the simple method described here. We call it EmailFlow. It is low overhead and very easy to get started. Email is not separate from your "real" work. Email is very much a part of your workflow. Many of the activities you have to do as part of your work involve reading and writing email. 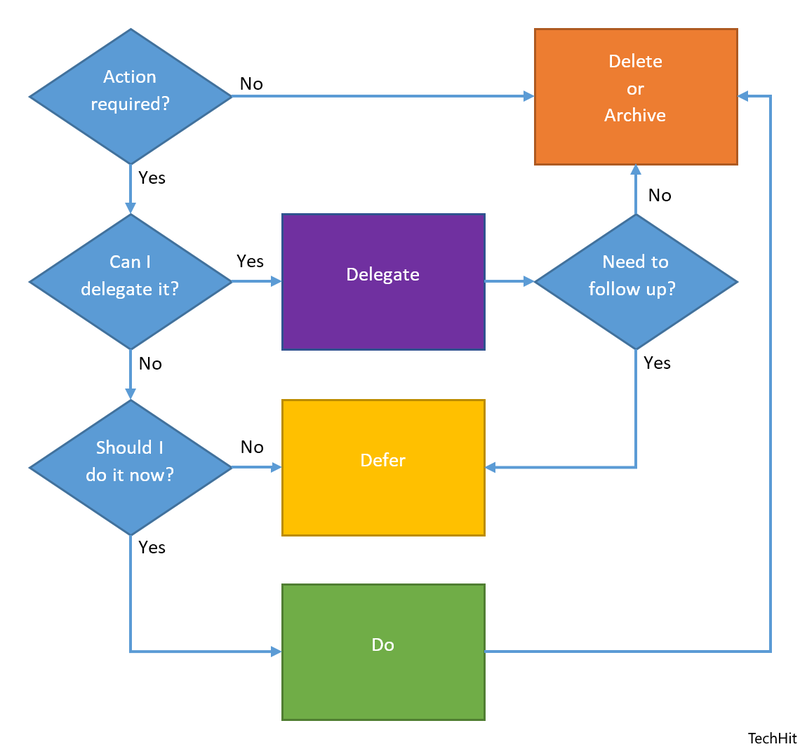 Use the EmailFlow described here to stay on top of the never-ending email stream and actually get your work done. Process each message that lands in your Inbox only once. Do not leave it in the Inbox. Use this flowchart to decide what to do with it. You must perform one of the actions, so you do not have to scan/process the same message multiple times. Be realistic. If you are leaving a message in the Inbox, hoping that you will notice it later and do something about it, you will not. With a small Inbox, you will always stay on top of what you need to do. You will never miss an important task, just because the message is out of sight, several pages down the list. Small Inbox = things get done on time with less stress. Delete. If you do not need to keep a message, simply hit the Delete key. One big "Reference" folder for everything. Create a Quick Step button to move message to that folder. Create folder structure for organizing messages. One folder per client or project. Do not go too granular, at least initially. Use SimplyFile to quickly file messages into these folders. Forward the email to the right person to action on it. If you need to follow up, create a reminder for yourself using Defer (see below). If it needs to be done at a specific point in time, put it on your Calendar. Using "Task It" in SimplyFile. Otherwise (no deadline), move it to the ToDo folder. (Create a Quick Step for it). If the action takes little time and can be done immediately, do it now. For example, quick email reply or phone call. Now that you have a solid system for processing incoming messages, you can methodically handle your tasks, one at a time. If a reminder for a task you deferred pops up, handle it. Otherwise, pick an item in your ToDo folder to work on. Admit to yourself that some of the tasks on the list will never be accomplished. Drop them. Items that you have snoozed a few too many times are good candidates for this. Talk to your manager for help with prioritization and resources. We would love to hear how this workflow works for you. No comment or question is too small. Looking forward to hearing from you!